“With Our Loving Hands: 1199 NE Nursing Home Workers Tell their Story“ is an unusual book for several reasons. First of all, the authors are workers, they’re women and they mainly immigrants. The stories are about their lives and about their work in nursing homes as “Certified Nursing Assistants”- work that is underpaid and underappreciated. As the title says, these are stories about work, but work of a special kind, because in addition to training and practical skills a requirement of the job is kindness. Some of the stories are also about the writers’ personal lives and struggles, their family situations and the reasons they become nursing home workers. My only criticism of the book is that the stories don’t convey how hard these jobs must be: working with unhappy or uncomfortable patients; doing physically demanding and low paid work. 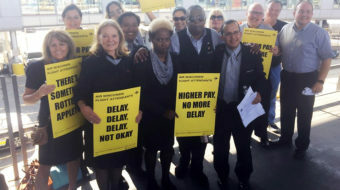 I imagine there must be problems with lack of respect by administrators, and with wages, sick days, and other benefits that the union has fought to extend to all of the workers it represents. I imagine it has to be hard to work in a setting where death is a regular occurrence. In his introduction, Bender says that over many years with the union, he’s heard members’ stories, some of which make him smile while others “leave me sad and shaking my head.” The collection doesn’t include many of those, and that left a gap. Nursing Home Certified Nurses Assistant Glorin Smith reads a story about a client who did not look well and what she did about it. 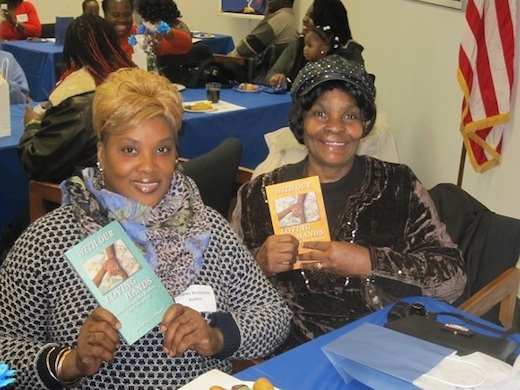 Photo: 1199NE members Sharon Benjamin and Advira Linton, two of the authors published in Hard Ball Press book, “With Our Loving Hands,” attend a celebratory book launch at 1199Training Fund in New York City, Dec. 11, 2014 (via 1199Training Fund).